According to Joe Stanley Line2Line Coatings' abradable powder coating can actually give an "unobtanium" (no longer available) antique car piston a longer service life. Line2Line is licensed to manufacture and apply these patented coatings that have clearance control, anti-galling and low friction properties. Stanley, a former motorcycle racer, is Line2Line's VP of Powersports. He says this technology was developed for the automotive industry. It has been used on millions of vehicles since 2000 and Line2Line is offering it to racers and restorers. In addition to pistons, it can save or improve pumps, gears and rotors. Brian Neal, Jennaa Smith and Joe Stanley were at the PRI Show to introduce racing and performance enthusiasts to the advantages of the use of abraded powder coatings as piston, gear and pump clearance coatings. "We differ from other companies in the coating industry, because we do abradable powder coating," Stanley explained at the Performance Racing Industry Show in Indianapolis, Ind. "An important benefit of this type of coating is that it allows us to control clearances inside a motor, gearbox or pump." Stanley was at the PRI Show to promote clearance control coatings for racing applications, but their benefits can also help car collectors and restorers. Stanley said that vintage motors can be saved by using such coatings on piston skirts. 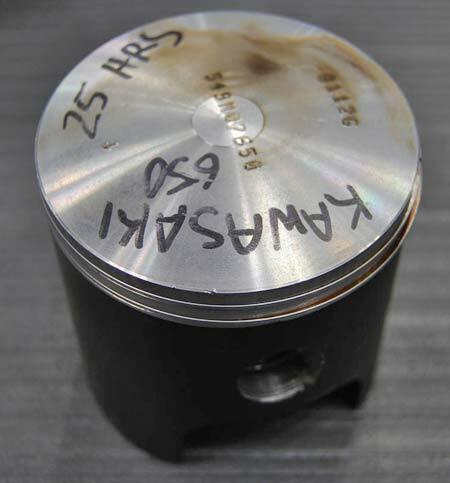 "If someone has a vintage motor application; if someone has a worn piston that is no longer available, we can take the bore dimensions and we can take that piston and build up product on the skirt to take up that kind of looseness situation," Stanley explained. "We can actually give that piston a longer life!" Being involved with powersports, where pistons in small, high-revving engines take more of a beating than vintage car pistons, Stanley pointed to vintage motorcycle enthusiasts that Line2Line has helped. "We've done a lot of vintage motorcycle pistons because there's a lot of bike manufacturers who have long since gone out of business and there are zero parts available for their products," he pointed out. "Collectors would go to swap meets and buy basket cases because that's really the only way they can get the stuff and our clearance control coatings provide a solution for them when they reuse those parts." Stanley said that abradable powder coating has a positive effect on both performance and durability of an engine. "One of the best examples of this is a racer named Mike Janis who we work with and who a lot of drag racers have heard of," he noted. "When he first started coming to us Mike was typically getting 20-22 passes with his motors and now he gets in the high 30s with the clearance coatings, so they're almost doubling the life of his pistons." In the racing end, Line2Line works on any racing car that takes a motor. "We develop and manufacture the coatings in-house," Stanley said. "We understand the properties needed for each racing application. We can dial in the coating hardness and thickness to optimize the performance of a specific motor. " Stanley emphasized that you can have a motor that runs for hours in a certain types of racing such as motorcycle endurance competitions or stock car races. Someone else may have a drag racing car with a very short, but intensive expansion time for its pistons. "We know how to apply the product properly to accommodate different situations with the best results," he said. According to Stanley, Line2Line's customers—especially in the racing industry—tend to be people who understand the technology of a piston. "They get the whole power issue, so what they will do is take a bore measurement, then box the pistons up and send them to us with that measurement," he explained. "Then, we measure the pistons and decide how thick we're going to go with our application. We'll also fine tune (the coating) to what the racing application is." Stanley said there are cases of circle track or dirt track racers who might have started out the season with a new set of pistons and when they pull their motor down they discover they have clearance issues even though the pistons are still in great shape. "They send them to us and we work with the measurements they give us and we can still bring the clearance back for them." With his focus in powersports, Stanley says he deals with a lot of pistons that operate in a high-rpm environment, which he says is the toughest situation for piston wear. "Clearance coatings will decrease that wear because your pistons will not be rocking around in the bore," he stressed. "With our ability to control clearances and tendency for the coating to wear into an optimal clearance condition, we wind up stabilizing the piston within the bore so it's not rocking around and it's not wearing on that piston or that bore. It also stabilizes the rings so you get better compression and crankcase pressures because you don't have it wobbling and losing the ring seal. It keeps your rings truer to the bore." In addition to the extending the service life of old pistons you can't find anymore, clearance coatings can make new pistons work better and last longer. "We see a lot of both kinds of business and we thrive on word-of-mouth advertising," Stanley said. "People will seek us out if they are doing a rebuild or if they have a problem motor. We have seen everything from racing car issue to the folks with a vintage motor that parts like pistons are no longer available for." Line2Line has been doing piston coating for about eight years. 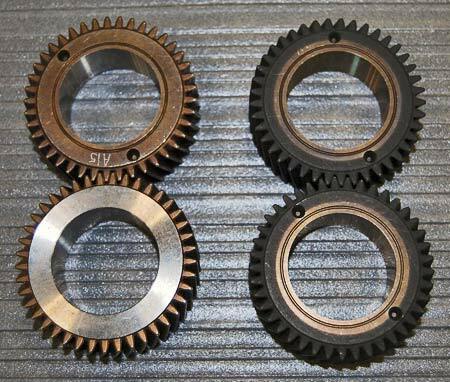 The process can also be used to save worn gears or improve the performance of new ones. "This got started when companies that had problems with racing gears approached us," Stanley advised. "They had problems with noisy gears and gear lashing issues and customer complaints about noisy transmissions with loud gears. They came to us for solutions and with the properties that we had developed for our coatings their needs were a perfect fit with our stuff." Pumps are another component that can benefit from the application of clearance coatings. "We can coat fuel pumps, water pumps and all other kinds of pumps," Stanley said. "This is another niche that sought us out instead of us seeking it out. The pump companies came to us. We found out that if customers had a worn pump, the clearances could be taken up; and if they just needed increased pump pressure, you can get that by using coatings inside the pump." Stanley indicated that Line2Line's biggest market is coating supercharger rotors for an original equipment manufacturer that has millions of the rotors in cars on the road today. "We think the piston coating business is going to develop into something like that, too," Stanley estimated. "There are pistons in everything, so it's just a matter of making our way further into the market than we are today." Stanley said he worked in the research and development end of the eight-employee business when Line2Line started developing the coatings. In addition to motorcycle racing, he had a "bit of a mechanical background." Back then he helped develop the product and experimented with different formulas to see what worked best as far as hardness and thickness. He still gets involved on the research end through working with Mike Janis, who also races snowmobiles and boats. "Thanks to Mike, we've helped people with vintage sleds," Stanley noted. Line2Line has been approached about the use of clearance coatings for other unobtanium parts. "For instance, companies have asked if we can deal with shaft wear," said Stanley. "But, that's not really where we want to be; we have enough focuses as it is right now, so we're not looking to go outside our current niches." According to Stanley, Line2Line is the only company offering abraded powder coating to the racing and restoration industries. The cost of doing individual pistons is $34 and doing a set of eight costs $240. (We didn't ask for prices on 12 or 16 pistons!) For additional information about clearance coatings contact Line 2 Line Coatings, 4866 White Lake Rd., Clarkston, MI 48346. The Website is www.line2linecoatings.com or you can call (248) 625-3052. 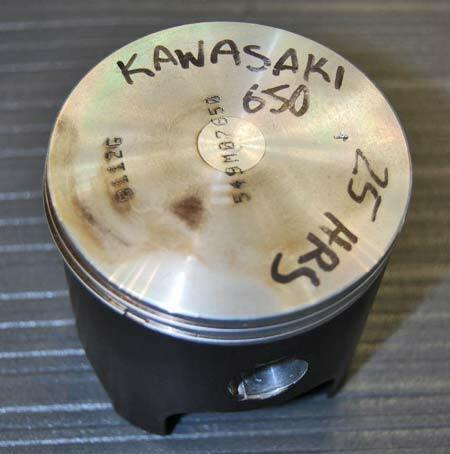 This old piston from a Kawasaki 650 motorcycle has been restored to factory specifications by the application of a black-colored abraded powder coating with a specific hardness and thickness on the piston skirts. 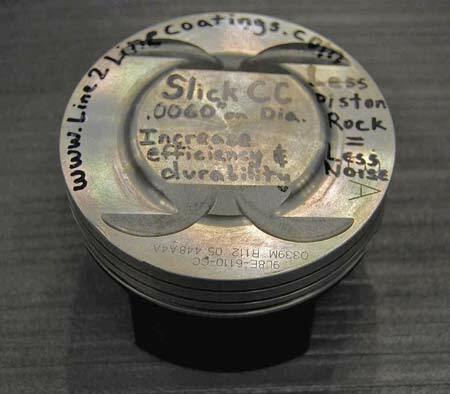 The writing on this coated piston lists the advantages of using an abraded powder coating such as increased durability and efficiency and noise reduction through the elimination of piston rock. Line2Line has been coating new pistons and saving old ones for about eight years. Doing an individual piston costs $34 and there are volume discounts. Line2Line thinks that the piston business is its best future growth area. You can clearly see the difference between the rusty gears on the left (which would probably be pitted if cleaned up) and the clearance coated gears on the right. The abraded powder coat can fill the pits and restore OE specs. 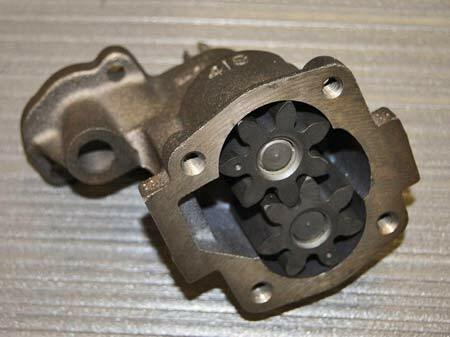 Fuel pumps, water pumps, oil pumps and power steering pumps can all be "restored" by coating the inner casing surfaces and gear surfaces with properly applied abraded powder coat.